The trail begins at a boulder opposite the town hall in Port Hope, located on the north shore of Lake Ontario. 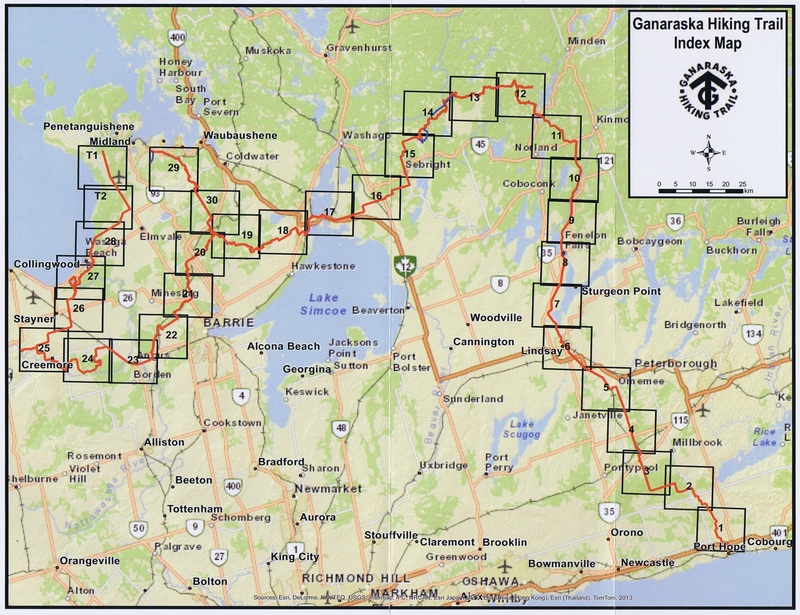 The trail passes through a variety of scenery from Lake Ontario, north through the Ganaraska Forest on the sand hills of the Oak Ridges Moraine and past the lakes and drumlin fields of the Kawarthas to the rugged wilderness of the Canadian Shield. The unique Wilderness section of the Trail is on the Pre-Cambrian shield and connects the southern and northern parts of the Trail. The Trail then continues west through the rolling hills of Simcoe where it meets the Bruce Trail at McKinney’s Hill, Glen Huron. A cairn marks the end of the Ganaraska Hiking Trail. The Trail continues from the Niagara Escarpment to a terminus at Wasaga Beach. A second branch of the Trail runs from north of Horseshoe Valley to Highway 32 near Port McNicol on Georgian Bay. From Springdale, just west of Glen Huron in the Mad River section, a branch of the Trail leads to Wasaga Beach. Another branch extends from north of Horseshoe Valley in the Oro-Medonte section to the Wye Marsh Wildlife Centre in the Midland section.